Asian gets a makeover! Grilled chicken strips, rice, carrots, and a citrusy sauce. 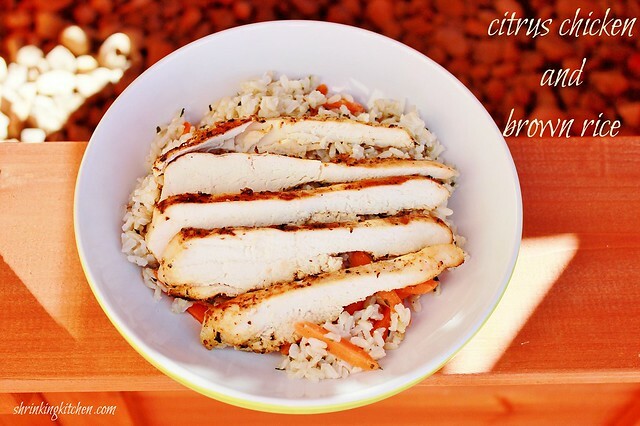 This Citrus Chicken with Brown Rice is a wonderful combination! It’s sweet and tangyand will tempt your taste buds, and making this yourself will be easy on both your wallet and your waistline. Let’s face it, no matter what you tell yourself, Asian food isn’t the lightest, but this lightened up recipe comes together fantastically. Try it with shrimp or tofu, too! In a small bowl, combine vinegar, pineapple juice, 3 tbsp water, the soy sauce, honey, garlic, and ginger. Whisk until smooth; set aside. Heat grill or wok to medium-high heat. Combine chicken and 1/3 cup of the dressing in a resealable plastic bag. Marinate at least 15 minutes. Meanwhile, bring a large pot of water to a boil. Stir rice into pot and cook according to package directions. Drain. Remove chicken from marinade; discard marinade. Grill for 3 to 4 minutes, turning halfway through. Add carrots for the final minute or two, cooking until warm, but still firm. Transfer to a cutting board. Toss rice with the remaining dressing and the salt. Slice chicken and carrots into thin strips, and scatter over rice. Sprinkle with mint, if desired, and serve immediately. Enjoy! It’s funny, once we started cooking our own, we almost stopped going/ordering out Chinese, altogether. :) I hope you love it! I just made this for lunch today, and it was great! Quick, simple, and tasty. My kids both liked it, too. I made double the amount of chicken and will use the extra later this week to make the lo mein shrinking kitchen posted recently. Can’t wait! So glad you like it, Carrie!